GREENVILLE — A band of enforcers doubling as the Southern Miss basketball team imposed an offensive curfew at East Carolina in the final 10:09 and kept the Pirates winless in Conference USA by a 60-46 margin on Saturday night. The Golden Eagles' scoring ban went into effect after a free throw by Petar Torlak had put ECU ahead 43-42 at virtually the midpoint of the second half. The Pirates managed just one curfew violation, a 3-pointer by Paris Roberts-Campbell with 2:05 to go. By then, Southern Miss was well on its way to its 18th win with a 56-46 lead. USM's football woes — just one win in the last two seasons — could be attributable to the fact that the best athletes in Hattiesburg appear to be playing hoops. There seemed to have been a collection of muscled-up and cat-quick converted cornerbacks, linebackers and tight ends on the loose in black and gold in Williams Arena at Minges Coliseum. 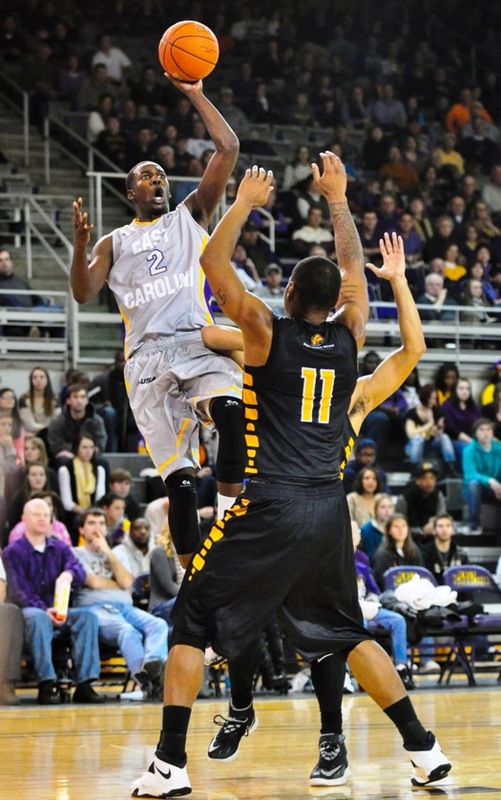 "Their toughness, physicality and quickness is off the chains," said ECU coach Jeff Lebo. The Golden Eagles (18-3, 5-1 C-USA) outscored their hosts 34-2 in the paint. While Southern Miss worked inside out, the Pirates committed to a long range attack. "We thought our best chance was to shoot the three," Lebo said. Live by the jump shot and die by the jump shot as the saying goes. ECU flourished early on, a pair of free throws by freshman Caleb White putting the Pirates ahead 28-18 with 4:33 left in the first half. ECU true freshman Caleb White scores two of his 13 points in the first half. The Pirates hit seven of 18 from distance in the first 20 minutes and led 30-23 at the break. ECU was tied at 37 with Old Dominion at halftime of its league opener and has been on top at intermission in each of its subsequent C-USA contests. But what has transpired is seemingly a continuous loop of the tortoise and the hare. The Pirates start fast but the lack of depth from program departures and injuries is eventually too much to overcome. ECU doesn't give in as much as the Pirates give out. ECU made just five of 17 behind the arc in the second half as Southern Miss's extended pressure had a cumulative effect. Akeem Richmond led the Pirates with 18 points but he was essentially a solo act in the second half. White had all 13 of his points in the first half. Michael Zangari was scoreless in 17 minutes. Brandan Stith returned from a concussion after missing a 59-54 home loss to Tulane on Thursday night but he had no points in 23 minutes. Antonio Robinson didn't scratch in the scoring column in 13 minutes. ECU senior guard Petar Torlak defends against USM guard Neil Watson. Lebo said he played zone exclusively for the first time in his coaching career. The Golden Eagles eventually solved the scheme with drives, dishes and kickouts to knock down 13 of 25 shots (52 percent) in the second half. "They have great balance," Lebo said of Southern Miss. "They have five guys averaging between nine and 12 points. Any of those guys can jump out and score 20. Tonight it was Boardingham." Senior Daveon Boardingham had 15 points. Michael Craig had 12 points and 11 rebounds. Jerrold Brooks and Neil Watson added 11 and 10 respectively. ECU (11-9, 0-5) is the only winless team in C-USA with Rice's 71-69 victory over Charlotte on Saturday. Southern Miss is tied with Louisiana Tech for the league lead. The Pirates visit Middle Tennessee for a 7 p.m. game Thursday and then play at UAB at 2 p.m. Saturday. "We'll regroup and get ready," Lebo said."